As we walked from Barton on Sea into Highcliffe we crossed the county border from Hampshire into Dorset. Hooray! I stopped to take a photo for posterity. What is it about bunny ears? If my pictures aren’t photo-bombed then the people in them appear to sprout bunny ears. If it’s not one of those pesky kids it’s the other. Poor old Uncle Alex tried his best to smile for the camera, but he just wasn’t quick enough. My kids time their bunny ears to perfection. I swear there are no bunny ears when I take my photographs but later, when I plug my camera card into my PC, someone, somewhere, has bunny ears in almost every shot. My kids are totally indiscriminate in their bunny bestowals. Friends. Family. Schoolteachers in school photographs. It doesn’t matter who is being photographed or where they are being photographed; my kids get them all. In Victorian times it was not uncommon to take photographs of the recently deceased. I am pleased my children were not born into the Victorian era. But just in case, when I go, I’m going to be cremated as quickly as possible. 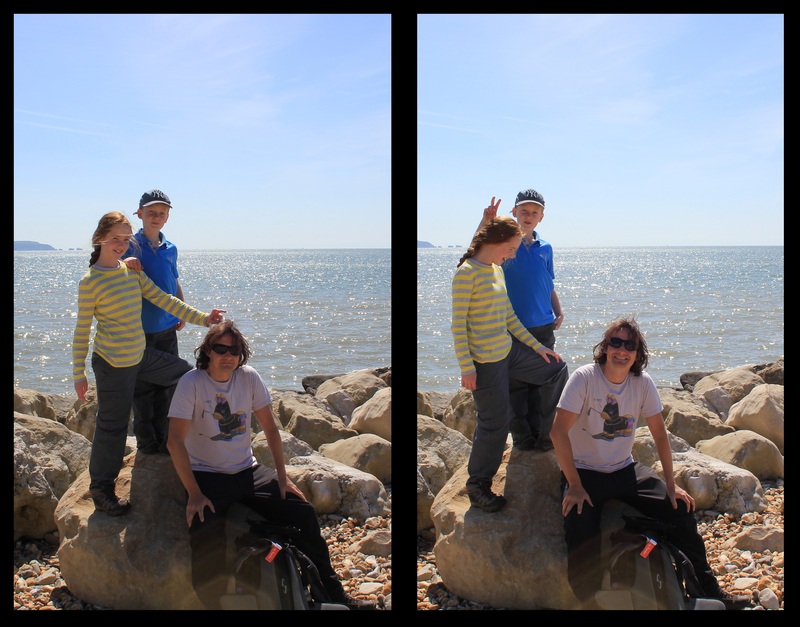 I gave up trying to take pleasant family photos and strode off towards Mudeford, hoping that I might find something more unbunnyable (unbunnyable – adjective – difficult or impossible to receive bunny ears during photography). But when my kids are around even the most unbunnyable of people suddenly seem to sprout ears. This entry was posted in Dorset and tagged bunny ears, coast, Dorset, Highcliffe, photography, travel, walking. Bookmark the permalink.